December 2, 2012, the Commemoration Day of St. Philaret, Metropolitan of Moscow – His Holiness Patriarch Kirill of Moscow and All Russia celebrated the Divine Liturgy in the cathedral Church of Christ the Saviour, where the relics of St. Philaret are kept. 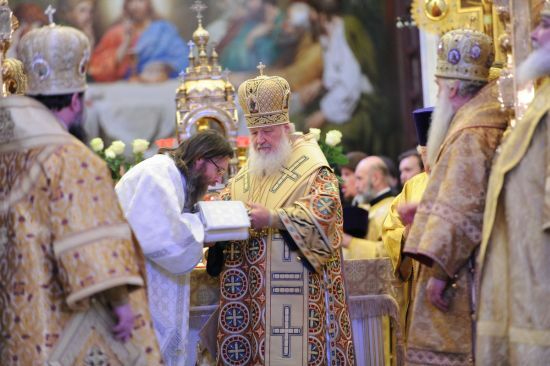 During the liturgy, Patriarch Kirill led the consecration of Archimandrite Feodor (Belkov) as Bishop of Alatyr and Poretskoye, Metropolis of Chuvashia. Among the worshippers were abbesses and clergy from several convents and lay people who came from Chuvashia. The service was attended by Chuvashia President M. Ignatyev, Chairman of Shuvashia State Council Yu. Popov, Chuvashia Minister of Culture V. Yefimov, and Alatyr Governor N. Romanov. After the liturgy, His Holiness Kirill led the congregation in the praising of St. Philaret at the shrine with his relics. Then Patriarch Kirill delivered a patriarchal homily and conferred decorations on several archpastors who marked their anniversaries in 2012. Among those awarded was Prof. N. Drozdov, Moscow State University, a relative of St. Philaret (Drozdov). He was awarded the Order of St. Macarius, Metropolitan of Moscow, in recognition of this zealous academic and social service and on the occasion of his 75th birthday.